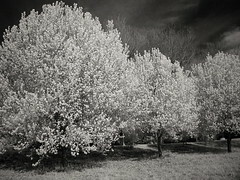 A string of Pyrus calleryana with their pure white blossoms in Shreveport. If the Bradford is too common for you Shreveport Green has more tree ideas. Thank you to Mike Roseberry for letting RRBJ use his photo.